Special Summon 1 “Mekk-Knight” monster from your hand or Deck in face-up Defense Position, but return it to the hand during the End Phase. For the rest of this turn after this card resolves, you cannot Special Summon monsters, except “Mekk-Knight” monsters. You can only activate 1 “World Legacy’s Memory” per turn. 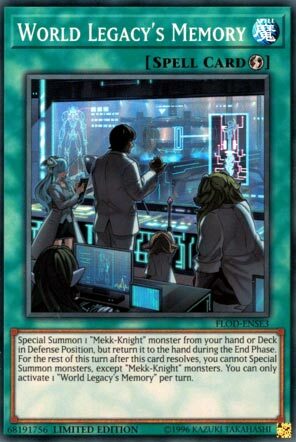 World Legacy’s Memory is a QuickPlay Spell Card that Special Summons one Mekk-Knight Monster from your hand or deck in Def position. You can only activate this free Spell once per turn and the monster returns to the hand during the End Phase. Finally, you are restricted to Mekk-Knight only Special Summons after you resolve this effect. So during your opponent’s turn, none of that matters. During your own turn, this is one of the only ways to Special Summon a Mekk-Knight during turn one when your opponent hasn’t done anything. I like it and it needs to be run in triplicate to advance Mekk-Knight offense. But I do not get the artwork. Remember when Mekk-Knights were Wolverine? Me neither. Score: 4/5 Art: 2/5 It would look good as a different card. Starting off this week with one of the preview cards in the Flames of Destruction: Special Edition from Cybernetic Horizon, World Legacy’s Memory. Memory is a Quick-Play Spell that lets you Special Summon a Mekk-Knight from your hand or deck in Defense Position, but it returns to the hand during the End Phase. You can only use 1 Memory per turn and you cannot Special Summon monsters except Mekk-Knights for the rest of the turn after this is activated. Mekk-Knights usually get on the board very easily, but this helps speed them up some more. Getting any Mekk-Knight out of the deck is great, unless it is Avram. Sure you will be locked into only Special Summoning Mekk-Knights for the remainder of the turn, but you should do those summons before you use this. If you get Purple Nightfall or already have it on the board, you can basically ignore the return it to the hand part as Nightfall will banish the Mekk-Knight for another search. This is a great card for the Mekk-Knight archetype, play multiples of this in Mekk-Knight builds to speed your deck up some more. Art: 4/5 I’m getting SPYRAL vibes from this art, kinda reminds me of SPYRAL Resort. Cards that are solid assets and do good things for a theme are a thing (as a whole) I feel Yugioh doesn’t have much of. It seems, as a general rule, that most themes are either over supported, or barely supported, if at all. This is a great card for Mekk-Knights. You get to Special Summon one (from your Hand OR Deck) in face-up Defense position, giving you the ability to use this offensively, or defensively (as this is a Quickplay Magic). You can only use one of these a turn, which keeps it from being broken, while still letting it be a genuine help. You are restricted to Special Summon only Mekk-Knights, but that’s fine too, as either you will offensively, or defensively, the Monster is likely going to be destroyed as a sacrificial protector. (If it survives, it returns to your Hand during the End Phase) which actually IS rather helpful if you use this on your opponent’s Turn. It gives you a resource (even if it does go to your Hand) you wouldn’t have had prior.